Looking for the very best in cephalopod-based power management? Look no further than the PowerSquid. 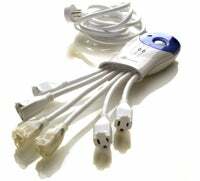 Instead of crowding all of your plugs next to each, with nary of enough room for the brick-like power adapters so many device seem to use these days, the PowerSquid provides six separate "tentacles," so you can plug in whatever you want without having to worry. The 8' cord attached to the head of the PowerSquid features a rotating plug, so you can jack it into an outlet without having to worry about what else you'll be able to plug in—the PowerSquid's middle name, after all, is "accommodation." When it comes to the job of protecting your sensitive equipment from electrical surges, the PowerSquid is likewise on the game. Its surge protection is rated at 3240 joules—pretty high, if you're wondering. All of this comes at a price, though: the PowerSquid Calamari 3000 (which features, among other things, two glowing plug receptacles) clocks in at $80. A little much for my surge protection needs, but hey, something for everybody.